TMP offers a full range of laminators from small laboratory presses and prototype units to fully-automated or multi-station systems. TMP printed circuit board (PCB) lamination presses lead the industry in advanced engineering and system innovations. 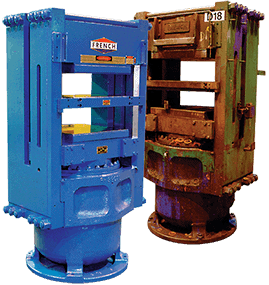 Our Hydraulic Vacuum Press systems come in a large variety of standard and custom sizes and capacities to fit your needs. Specialized heated platens, up to 1200°F, allow high temperature lamination for maintaining homogeneous material properties. TMP offers a full range of plastic card lamination press options from small lab presses and prototype units to fully-automated or multi-station systems. The Plastic Card Lamination Presses offer precise pressure and temperature control for laminating contact and contact-less cards. TMP offers a full range of large format laminating presses from semi-automatic to fully-automated systems. TMP has introduced “The Starter”, a small lamination press suitable for low-quantity, special card production, laboratory or prototype work, or as a start-up press for new companies. The Starter Lamination Press is compact and easy to install and operate with basic automatic controls, providing accurate temperature control of the electrically heated platens and an electronic timer. Contact a TMP representative for more information about our lamination press designs. State of the art automation features are designed to increase profitability through efficient utilization of material and labor are also available.